EDITOR’S NOTE: The original story identified a source as a combat veteran and former Navy SEAL. A records search has since revealed that he significantly exaggerated his military record. His comments have been removed from the article, and the headline has been changed. We apologize to our readers. Much of today’s opposition to stronger gun safety regulations rests on the gun lobby’s Hobbesian vision of self-sufficient, heavily-armed citizens standing up to vicious thugs. This Die Hard argument is constantly parroted by politicians and conservative pundits. But the statistical reality is that for every justifiable homicide in the United States—for every lethal shooting in defense of life or property—guns are used to commit 34 murders and 78 suicides, and are the cause of two accidental deaths, according to an analysis of FBI data by The Washington Post. Those interviewed for this article agreed that the key distinction isn’t between “good guys” and “bad guys,” because intentions are less important than the rigorous—and continuous—training that it takes to effectively handle firearms in high-stress situations. Dr. Pete Blair, an associate professor of criminal justice at Texas State University and director of the Advanced Law Enforcement Rapid Response Training Center (ALERRT), has studied mass shooting incidents and trains law enforcement personnel to respond to active-shooter situations. The cops who go through his course conduct live-fire exercises using real firearms which are re-chambered to fire “soap rounds” that leave only welts when they hit. For every justifiable homicide in the US, guns are used to commit 34 murders and 78 suicides. Tactical officers typically receive training in “judgmental shooting,” which includes knowing when it’s prudent to hold their fire, and “blue-on-blue awareness,” which drills into them the importance of considering whether other cops are present, including officers who aren’t in uniform. They’re trained to overcome tunnel vision by looking not only at their target but also maintaining an awareness of who or what is behind it. “The notion that you have a seal of approval just because you’re not a criminal—that you walk into a gun store and you’re ready for game-day—is ridiculous,” says Chipman. A case in Texas two weeks ago highlights the risks of civilians intervening in chaotic situations. Police say that as two carjackers struggled with the owner of a car at a gas station in northeast Houston, a witness decided to take action into his own hands. He fired several shots, but missed the perpetrators and shot the owner of the car in the head. He then picked up his shell casings and fled the scene. Police are still looking for the shooter. The gun lobby and some conservative politicians have seized on a “study” by Davi Barker, a conservative blogger, which purports to show that when a “good guy with a gun” is present during a mass shooting, an average of 2.5 people die, but in similar situations where nobody is armed, there are an average of 18 deaths. A firearm makes a person almost twice as likely to become the victim of a homicide and three times more likely to commit suicide. Blair co-authored a study for the FBI that looked at 185 mass shooting events over a 13-year period. It found that while around one-in-five were stopped by civilians before police arrived, in only one case was it done by a typical “good guy with a gun” (professionals—an off-duty cop and an armed security guard—used their guns to stop two others). In most cases Blair and his colleague studied, civilians ended a rampage by tackling the assailant. None of this has prevented the gun manufacturers’ lobby from insisting that more guns make a society safer. And many Americans have come to believe it. 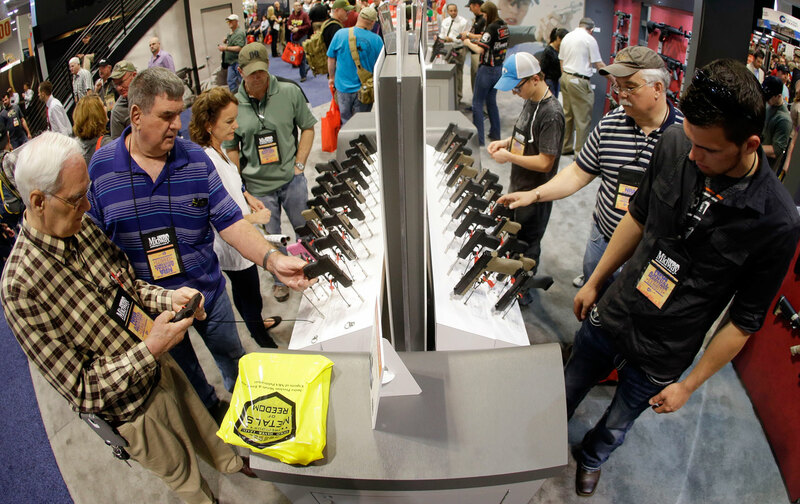 According to the Pew Research Center, the share of gun owners who cite “protection” as “the main reason they own a gun” almost doubled between 1999 and 2013, from 26 percent to 48 percent. Editor’s Note: An earlier version of this piece incorrectly stated that last week’s shootings in Oregon ended when the shooter was tackled.